As was explained in a previous post, the right to protest is covered by Article 11 of the European Convention of Human Rights, which guarantees the right to freedom of assembly. Article 10 (freedom of expression) is also relevant, since protests are an important and, in principle, legitimate means of airing and drawing attention to public grievances. In this particular case, Article 5 also came into play, since it was arguable that the kettling of all protesters, violent or not, so that none could leave the protest zone, unlawfully infringed their right to liberty and security of the person. 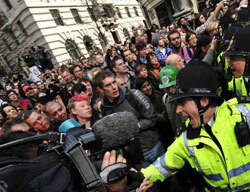 The first use of kettling on 1 April 2009 was in relation to the protest outside the Bank of England, which was marred by violence and damage to property. The assembled protesters, having been urged by organisers to “lay siege” to financial institutions, tried to set fire to the Royal Bank of Scotland building, threw missiles, and looted computer equipment. In contrast, as the BBC reported over the course of the afternoon, the Climate Camp was characterised by a very different mood, with an “almost Glastonbury atmosphere”, featuring “music and meditation”. The court heard how CS Michael Johnson, the officer with responsibility for police operations in respect of both demonstrations, decided to impose “full containment” (i.e. kettling) at the Bank of England protest at around midday in order to prevent breaches of the peace. He feared that if those protesters were not contained, there would be groups running amok in the City causing damage to property, and people attacked or put in fear of attack. They were to be dispersed in a controlled manner at 7.00 pm. This was conducted under the auspices of section 14 of the Public Order Act 1986, which enables the relevant senior police officer to impose conditions on a public assembly when he/she reasonably believes that the assembly may result in “serious public disorder, serious damage to property or serious disruption to the life of the community”. Mr. Johnson also decided that at the time the protesters from the Bank of England protest were being dispersed, the protesters at the Climate Camp would be kettled. This was to prevent the violent protesters from the Bank of England protest joining the Climate Camp and hijacking their peaceful demonstration; if that occurred, he considered that breaches of the peace would be imminent. It was this decision to kettle the Climate Camp which was focus of the challenge brought by two of the protesters caught up in the Climate Camp containment zone. They argued that the decision of the police to enforce containment of the Climate Camp protest was unnecessary and unlawful, both as a matter of common law, and under the European Convention of Human Rights. In reviewing the case law on policing handling of protests, the Court endorsed the basic principle that in order to take action against a protest so as to prevent a breach of the peace, there had to be a reasonable apprehension that a beach of the peace was imminent. The action then taken had to be reasonable, necessary (in the sense that there was no other way of preventing the breach of the peace) and proportionate. In accordance with Austin v Commission of the Police of the Metropolis  1 AC 564 (a case dealing with a protest at Oxford Circus in 2001 at which the technique of kettling was used extensively for the first time), action which meets these requirements amounts to a restriction on, rather than a deprivation of liberty, and therefore falls outside the ambit of Article 5 of the Convention. There is also no infringement of Articles 10 and 11 in these situations, since those rights may be qualified in such circumstances. The requirement of imminence is relatively clear-cut and appropriately identifies the common law power (or duty) of any citizen including the police to take preventive action as a power of last resort catering for situations about to descend into violence. That is not to suggest that imminence falls to be judged in absolute and purely temporal terms, according to some measure of minutes. What is imminent has to be judged in the context under consideration, and the absence of any further opportunity to take preventive action may thus have relevance. Based on these cases, the judges accepted that in principle, reasonable action in anticipation of an imminent breach of the peace could include steps to keep two groups apart, and might also involve action affecting those not actively involved in a protest or imminent breach of the peace, but unwittingly caught up within it. However, their decision on the lawfulness of the kettling in the present case was to turn on the “imminence” issue. Whilst in general terms the judges had “considerable sympathy” for the police officers and the difficult situations they were facing, they decided that, even applying the concept of imminence with the appropriate degree of flexibility, there could be no reasonable belief that a breach of the peace was imminent in this case. Certainly, the behaviour of those at the Climate Camp alone did not justify containment, and the risk that they would be joined and hijacked by protesters dispersing from the Bank of England, having regard to the distance and route between the two demonstrations, was no more than that: a risk, which thus could not found a reasonable belief in an imminent breach of the peace. That risk undoubtedly required some action, such as e.g. police cordons at points where the Bank of England protesters might seek to join the Climate Camp, but it did not justify containment. The judges went on to decide that various actions by the police in regards to shifting and releasing the Climate Camp protesters were unlawful, although they declined to make any declaration in respect of the use of force by police in dispersing both protests, and upheld Mr. Johnson’s invocation of section 14 of the Public Order Act in order to bring the protest to an end later that night. By that time, the judges said, the protesters had had sufficient time to make their point so that their Article 10 and 11 rights had been duly respected. The court made no explicit comments on the appropriateness of kettling as a technique in general, although it acknowledged the arguments presented by counsel for the protesters, Mr. Michael Fordham QC, that its use is “controversial”. This can be seen in a recent report from Liberty on the police handing of the Trades Union Congress March on 26 March 2010. Liberty had 120 observers in the field that day, and concluded in its report that the technique of kettling was given too much focus and was too much relied upon by police. This was of concern, as it has a chilling effect on the exercise of rights of assembly and expression. Nevertheless, on the present state of the law, the technique is legal. This was established by the House of Lords in Austin, in which a mother’s challenge to the use of kettling at the Oxford Circus protest in 2001, which saw her contained within the protest for seven hours and unable to collect her child from creche, was ultimately unsuccessful. As the Guardian has reported, that decision is now being appealed to the European Court of Human Rights; it will be interesting to see whether the technique of kettling will survive the scrutiny of that court.